OFFICE BUILDING, corporate housing, SINGLE FAMILY, duplex, or AIRBNB??? Located 1/2 mile from Historic Bridge Street (2018 winner of America's Main Street Contest) and is in between Lake Shore Park and Walnut Beach, each being about a mile away. This Big BRICK Beauty has newer windows, 7 year old dimensional roof on building and garage, a full basement, a two car detached garage and an extra fenced in lot for a possible patio area for guests or room to add a second building or add on to the existing building (variance needed)! Lake views from the north rooms upstairs. 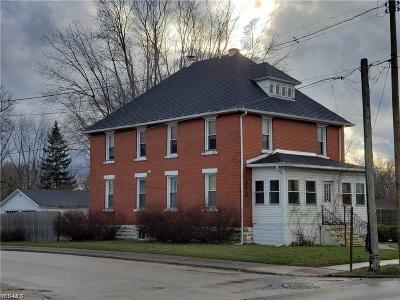 This is currently a duplex, but could very easily be changed into offices with front entry for the lower offices and rear entry for both upper and lower. Could also be a 5, 6, or 7 bedroom home or for nightly and weekly rentals with a traditional keyed entry door added to the rear porch. Upstairs could be closed off if guests only desire a 3 bedroom one week. Garage could be rented out for extra income. Additional parking could be added next to the garage. The full basement houses separate boilers, water tanks, and electrical breaker panels. Lower unit is rented on a MTM! The upper unit is vacant. Rents could be in the upper $800's or $900's + once the pig iron plant worker's start looking for housing! Upper unit has access to the attic with a high roof peak that could be finished into a nice room or office with a dormer facing the lake! Agent owned.